We are all familiar with the old expression, “Don’t raise the bridge; lower the river.” That’s exactly what 24M, a startup company in Cambridge, Massachusetts, has done. 24M was formed in 2010 by Dr. Yet-Ming Chiang and a group of researchers at MIT. Chiang’s name should be familiar to anyone who has followed the lithium-ion battery business over the past decade. He also founded A123, an advanced battery company that led the way toward more affordable lithium-ion batteries. It soared to great financial heights before it crashed back to earth. It finally went bankrupt and its assets were purchased by China’s Wanxiang. But Chiang and his group didn’t give up. They turned their attention to researching flow batteries which use liquid electrolytes stored in tanks. Need more storage? Just make the tanks bigger. Unlike lithium-ion batteries, a flow battery is temperature stable, can withstand far more discharge cycles and uses environmentally friendly electrolytes. But they tend to be quite large and heavy. Today’s batteries are manufactured using techniques left over from the days of making cassette tapes. When CDs replaced cassettes, Sony was left with lots of unused manufacturing capacity. It figured out how to convert that equipment to making electrodes for lithium-ion batteries using lots of thin plates. Each plate needed a spacer to keep it separate from the others. Those non-conductive spacers took up a lot of room in the completed batteries. According to a press release on Business Wire, until now, the battery industry has had two options to drive down costs – build massive and complex factories to produce lithium-ion batteries in high volumes or pursue entirely new chemistries that may never move from the lab to the commercial floor. Today, thousands of researchers around the world are hard at work trying to discover new battery chemistries, but Chiang and his team decided to think outside the box. They figured out a way to make thicker electrodes from semi-solid materials. Their process does away with all those spacers that were taking up 80% of the space inside conventional batteries. The new battery has 5 times as much storage capacity in the same space. “24M has fixed the flaws. We’ve made the world’s favorite battery better, fundamentally changing its cost curve by designing a more elegant and simpler cell and then making the batteries the right way – the way they should have been made from day one,” says Chiang. The 24 battery has several important advantages over conventional lithium-ion batteries. 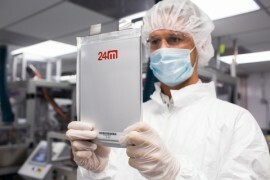 Fast Manufacturing Times: Start to finish, 24M’s cell creation takes one-fifth of the time of a conventional battery. Because semisolid lithium-ion doesn’t require binding, drying, solvent recovery or calendaring, it removes entire steps in the manufacturing process. Ultra-low Cost: The removal of those manufacturing steps means factories can be much smaller. A 24M factory requires about one-tenth the investment of a conventional plant. Flexible and Modular: Manufacturers can scale up in small steps to match supply to demand, making lithium-ion cost effective even at low-volume production. Environmentally Friendly: 24M’s solvent-free manufacturing platform creates the most easily recycled lithium-ion cell ever made. The key to the whole thing is something 24M calls a semisolid thick electrode. It increases the thickness of the “active” layer in a lithium-ion by about five times. That thicker layer improves storage capacity, while eliminating about 80% of the supporting structure that stabilizes multiple layers within a conventional lithium-ion cell. To put the whole thing together, 24M came up with a new approach to manufacturing that takes a matter of hours, compared to days for conventional lithium-ion batteries. The new process eliminates a number of conventional steps including binding, drying, and solvent recovery. 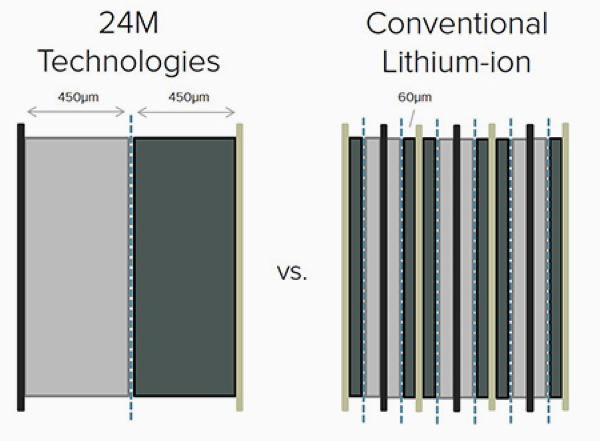 Current lithium-ion battery manufacturing leaders are Samsung SDI and LG Chem, with BYD, Toshiba, Panasonic (Tesla’s lithium-ion battery cell supplier), Saft, Kokam, Hitachi, Sony, Lichen, and Leclanche in a “contenders” group behind them, according to Navigant Research. Whether 3M would look to jump to that level of production or would choose to license its lithium-ion battery manufacturing breakthrough to top players in order to capitalize on it in other ways is unclear. Tesla is currently spending $5 billion to build its Gigafactory in Nevada. Chiang says his process could produce the same amount of battery storage products in a factory costing just $500 million. He thinks lower manufacturing costs will attract other entrepreneurs who would otherwise be frozen out by the high cost of building conventional factories. Speaking of Tesla, it has stated that it is open to shifting to better battery technologies as soon as it is clear that it makes sense to do so, and its factories are some of the most advanced in the world, using dozens of advanced robots for manufacturing. Surely, it would be willing to either utilize 24M’s technology in the under-production Gigafactory (if a good deal could be made) or at least in future gigafactories. One has to wonder if such talks have begun since 24M has unstealthed. 24M is focusing on large-scale grid storage for the time being, but the implications for electric automobiles are obvious. Chiang predicts that, by 2020, the cost of his batteries will be down to around $85 per kWh. Most experts say that the changeover from fossil fuel cars to battery cars for mainstream buyers will take place when battery prices fall below $100 per kWh. It is thought that Tesla is now producing batteries for about $250 per kWh and that it will get that figure down to under $200 per kWh when the Gigafactory gets into full production. If Chiang and 24M are right, what impact will their technology have on the battery business if they can slash the price of batteries by 50%? The phrase “game-changing technology” is greatly overused these days, but in the case of 24M, it may be the only way to accurately describe the importance of this breakthrough.